Cooperative culture done well, is pivotal in building the critical mass needed to reach a societal tipping point in this era of existential crisis. Is it time for co-op activists to look in the mirror? Worker cooperative members paused to take stock of where 20th century activism has landed progressive movements in 2017. This was a "parenthesis in time" for the co-op community to step away from the day-to-day of cooperative management, share, and be renewed by the powerful - WHY- of our involvement in the movement. Gathered in the morning pre-session of last weekend's Eastern Conference for Workplace Democracy (ECWD), co-op members thought about what needs to change if activists are to effectively engage with complex, interconnected 21st century challenges. Successful 21st century social change agents are those brave enough to let go of practices that may have worked in yesteryear, but are no longer up to speed. Worthwhile engagement with the degree of uncertainty and ever-increasing complexity of today's crises calls for nothing short of an evolutionary leap in collective self-awareness. The co-op activists in the ECWD room included millennials as well as seasoned veterans of the Civil Rights movement and were members of cooperatives from around the country. So, i was curious to witness how the group would respond to the morning's premise of, "letting go" of familiar movement tactics which no longer make the grade in an era of complex adaptive problems that metastasize spontaneously. We followed 20th century strategies used in a couple of movements to their 2017 conclusion. The environmental movement was first up on deck. The group noted how with one stroke of an executive order pen and a Cheshire Cat Grin, the current administration is dismantling 30 years of environmental protection regulations —hard-earned through lobbying, strategically targeted direct actions, demonstrations, and marches. "These approaches are what eco-Buddhist activist Joanna Macy calls 'holding actions' —important in the short run, but insufficient for creating transformative change. They invite activists to deconstruct, analyze, strategize and thrive in the seductive energy of the problem. The problem is externally objectified, and the solution is mistakenly perceived to lie in external action." After decades of policy work, petitions, and educational campaigns which built a foundation of environmental safeguards, the Environmental Protection Agency (EPA) budget has been slashed by 31%. 3,200 EPA jobs have evaporated just as Department of Energy Secretary Rick Perry is poised to close the International Office of Climate Technology. The defunded EPA Office of Environmental Justice, which had always protected the rights of the most marginalized on a shoestring, has gone dark along with 50 other EPA programs. ECWD participants lamented the dramatic erosion of Civil Rights legislation built on decades of life and death civil disobedience sacrifices made by millions. The Voting Rights Act is case in point. In 2013 (Shelby vs. Holder) the Supreme Court upheld the right of states to double down on campaigns to suppress the minority vote by eliminating early voting and same-day registration, disqualifying ballots filed from outside home voting districts and, inventing a host of new voter ID requirements. Gerrymandering is rampant. What then is the wisdom of allocating the lion's share of our time to 20th century "system reform" activism? 21st century, existential problems require evolved activism which has little to do with crowd rousing, feel-good theatrics. The ECWD group was more than ready to suspend allegiance to the "old ways," at least for the sake of exploring fresh possibilities. There was general agreement that longstanding "old-school" activism is easily erased in a blink of an eye since it is contingent upon a specific [type of] person being in office, the prevailing political climate, —and most especially, it doesn't shift unconscious beliefs and behaviors. Fresh from addressing millennial environmentalists on college campuses i suggested one holding action caveat: "In-the-streets" civil disobedience is understandably the primarily contribution young activists have to offer. Young people are transient and live away at college. They are focused on exams, life after college, grad school, paying back student loans, raising small children and trying to stabilize their lives. Long term, grounded environmental resilience-building or consciousness raising in anticipation of a post-carbon world most often isn't possible for this demographic. Direct actions galvanize hundreds of thousands of the like-minded, and feel great. As one ECWD participant quipped, "At least it feels like we're doing something." That in and of itself is valuable in the short term. Holding actions do indeed alleviate some short term suffering .However, flash in the pan demonstrations and strong-arm tactics will not prepare society to navigate the straits of climate change or make even the smallest dent in the agenda of the oligarchs holding government reigns. The 21st century will likely witness hundreds of millions of people caught up in cascading systemic collapse and transformation. This, even though the vast majority of Americans are, —or live as if they are oblivious. Global society has crossed a threshold, and the archaic system riddled with end-stage capitalism will cannibalize itself in time. Reform of a system which will inexorably meet the fate it has designed for itself therefore isn't a wise use of time. So, if, 1) the answer doesn't lie in reform of a predatory system from within, AND, 2) control of that system by mega-billionaire oligarchs renders the it impervious to populist battering rams from without, where do we turn? The group in the room was invited to turn toward the most deeply challenging and unsettling pathway - the internal landscape. In short, societal change that results in healthy evolution is first, and completely contingent upon individual, personal transformation in service to the whole. i suggested that the framework problem that underlies economic, political, social, and ecological, systems collapse is the warped Western perception of division and disconnectedness. The group was invited to see with fresh eyes. Human minds seek to make meaning and find purpose using whatever information is available. Global society is on an unsustainable course because the meaning we’ve made of the world has historically been erroneously based on the illusion of disconnection. A key to negotiating these turbulent times lies in unlearning this habitual thinking which limits our vision and dulls our social impact. Healthy cooperative collaboration is an antidote. An antiquated view of reality that no longer serves us remains our primary frame of reference! It's the prism through which most of us see the world. It is grounded in centuries old philosophy and science that hypothesized on the basis of what could be seen with the naked eye! Our attitudes, beliefs, behaviors, and the choices we make in 2017 all proceed from how and what we have been trained to see for generations, AND what we automatically filter out of conscious awareness. Most of us were imprinted with the “scientific method” as THE appropriate set of lenses through which to view the world. We are predisposed to immediately, reflexively, and unconsciously home in on division and separate elements. We focus on stratification, atomization, fragmentation, and "the other." This predisposition has been baked into our societal, economic, organizational, and personal conditioning for centuries. This is why maintaining harmonious group dynamics in cooperatives feels like an uphill struggle. It's often not a question of people being consciously willful. We've been culturally conditioned this way for generations. Many people cannot (or will not, given identity-investment) see their way clear of this limited perspective. It has become an article of faith. Beginning with the ancient Greek notion of the dichotomy between human beings and the cosmos, Western civilization has been built on the flawed cognitive foundation of duality. Cartesian “Age of Enlightenment” logic and Newtonian theories further anchored this narrow, distorted perception. People began to think of nature as a giant machine that could be reduced to its controllable parts and engineered by humans. Specifically the Universe was seen as a giant mechanical clock — dead matter. That view of nature as machinelike or inanimate matter has resulted in the egregious degradation of the Earth which we objectify and commodify. The principles that underlie the cooperative movement defy this antiquated thinking. Science however, has long since revealed this view to be limited in scope, and offers an alternative, holistic understanding of life. It provides a new way of apprehending aspects of the world that reductionism has been unable to explain. We'd do well to retrain ourselves to see systems. The Great Unlearning that prepares us to step up to the plate as 21st century activists is the shift from a linear, separation focus to an awareness of interconnected systems. Political, social, economic, human bodies, communities, and ecosystems are best understood through the prism of integration that recognizes how all of the parts relate to each other and the whole. In fact, the relationship between things is often more important than the things themselves. Cooperative, collaborative culture exquisitely executed mirrors this dynamic. A systems worldview, like cooperativism makes meaning from the world in a way that is accurately grounded in the reality of connection. Understanding the universe as a vast web of meaning of which we all are a part, signals a fundamental shift in values that could usher in the Great Transition to a compassionate, collaborative culture. However, these scientific insights have not been shared with most people. Education has not kept pace. So linear thinking remains a collective default position and comfort zone. The power of collective thought to sustain a matrix enables a critical mass of people to continue devoting thought and energy to upholding an illusion. The momentum of this outworn perceptual framework automatically directs the stream of our attention into the confines of a thin band of perception. This is the bandwidth in which hierarchical dominance, power and control dynamics, hyper-individualism, siloed, compartmentalized approaches to stand-alone projects, and lack of communication prevail in organizations and isolate individuals.“Parts logic” underlies the way we’ve internalized the self-referential hyper-individuality that enshrines itself as the “American way.” Marketers, the media, and educators have fused the identity image of rugged, loner individualism, to the point of selfishness and greed, to the ideals of freedom and liberty. Egalitarian governance and democratization of power in the cooperative movement opens the way to broader bandwidths which cultivate workers. Further, the myth of separation has enabled unfettered capitalism and consumerist culture to turn everything from human beings to the natural environment into commodities for exploitation. So, financial barons continually reinforce this frame of reference in service to the bottom line. This set of assumptions generates the alienation and loneliness we feel in the office and residential cubicles. This sense of separation from other people and our extended family of all living things is often what compels people to seek out cooperative culture. terminology barriers that reflect the projected meaning and world views of various constituency circles which don't necessarily understand each other. An example was given of the need to constantly calibrate between the world of those who live and work in the realm of new, regenerative, cooperative, gift, share, circular, steady-state economy and donors for whom market, corporate capitalism is the primary frame of reference. Areas in which cooperatives organically exemplify the evolutionary collaborative culture. One participant shared a beautiful story about the outward ripple effect of fully living into, "community." His community began by anchoring a project around members' building skills. They worked together to build bookcases which led to money making, which in turn put books of interest on the shelves. The books lead to book clubs and a host of other community projects which scaled up to the point where the space became a bustling community hub of events. Intentionally focus together on developing language to facilitate clear communication — a cooperative-culture Rosetta Stone which invites all of the circles noted above to come to a common understanding of terminology and of each other. 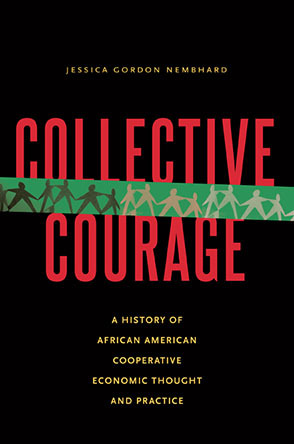 Anchor communities of color in the longstanding history of successful cooperatives among people of African descent. Cultivate the innate, communitarian nature in children from the cradle. Educate and acculturate them to collaboration and cooperation. Be mindful that the core, essential nature of authentic cooperativism exemplifies, and embodies the new paradigm. The task is to incessantly bring ourselves and our cooperatives back to that center when we are pulled in the vortex of the prevailing "separation culture." The cooperative movement is in a position to stand in the epicenter of social transformation, by simply doing what it is designed to do —mindfully, and exquisitely well.